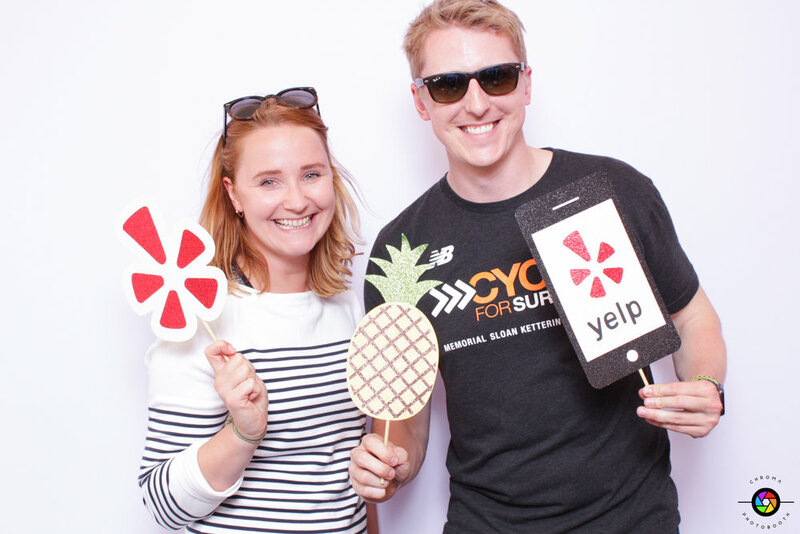 Following our amazing experiences with Gilead Sciences and Instagram, we decided to focus our next blog on how to successfully integrate a photobooth experience within YOUR next corporate event. Gilead Sciences reached out to us for our photobooth services during San Francisco Pride Day 2018, and Instagram hired us for an event at the Museum of the African Diaspora (MOAD) for Sista Circle: Black Women in Tech. For an external corporate events such as Pride Day and the event at the MOAD, our photobooths can be assembled in any location by our photobooth technicians, then promptly disassembled when the event ends. The space for the photobooth is critical because there must be enough distance between the camera and the backdrop to make sure multiple guests can fit within the photo. The height of the ceilings also must be tall enough to fit the backdrop. Please feel free to contact us if you are working with a smaller venue and have questions about if our full setup will fit prior to the event. If there is limited space, the digital booth can be a great alternative to the full setup. Our Digital Booth is a single piece of equipment with minimal setup. A backdrop can be used with that booth, but is not necessary. Many of our clients use the natural scenery as their background with the digital booth. An indoor event has much different lighting conditions than an outdoor event. Outdoor events are beautiful, but weather is a consideration as the equipment cannot get wet or too cold/warm. Weather can be unpredictable, so if you are planning on having a photobooth outdoors we recommend having an alternative indoor location just in case. Thankfully, our equipment adjusts to different lighting conditions and our photobooth technicians can make those adjustments as needed. Certain times of the year in San Francisco are certainly better for outdoor photobooth setups. Our photobooth technicians are very efficient during setup and teardown, but if you are renting a venue for a specific period of time we will want to make sure the photobooth is fully set up before guests arrive. During teardown, we also want to make sure everything is packed up before your venue rental time expires. Of course, our digital booth requires minimal setup time so that is also a good choice when you are limited on time. On our part, we make sure to offer recommendations for making your event run as smoothly as possible. The key to a successful event is constant communication! We can help you select a primary and alternative location if you are having trouble deciding on them. We always make sure to be respectful of the spaces that we are working within to help your business leave a good impression with the venue. Internal corporate functions are easier in the sense that the space utilized is company-owned, and event planners are already familiar with the layout of the room. A walkthrough of the space is still recommended, but it will take less time to complete than the process of driving to an outside venue multiple times for planning purposes. Weather will still be a factor with outdoor events, but the biggest consideration is simply the timeline of your event, and when you would like the photobooth setup/teardown to occur. If you have corporate social media accounts, the Digital Booth’s features can be used as shareable, promotional material highlighting your fun work culture! The full photobooth setup also comes with a digital album that can be shared across social media. Please let us know ahead of time if you would like your event to be featured on our blog, as that can also be shared. For both internal and external corporate functions, make sure to choose a photobooth location that people can easily access. If your booth is hidden away in a separate room, it won’t be utilized to its full potential. Creating signs that lead to the booth will ensure maximum participation. Gilead Sciences used our photobooth to celebrate a city-wide event, while Instagram hired us to celebrate a specific group. You could rent our booth for a local event, national event, corporate function (i.e. corporate dinner, awards, company anniversary) or for a specific holiday such as Christmas, New Years, Easter, etc. A booth is also a convenient way to capture your company’s charity event and to share on social media to spread awareness about the cause you support. Each of our photobooth packages include a custom template/border that is designed around the event you are celebrating. Backdrops and props are also important ways to customize your event photos. We have an arsenal of props, but you are welcome to bring your own as well. If you need help with coming up with creative ideas for your next event, let us know. We are always happy to offer recommendations! Here are some of awesome corporate events we have done in the past! Dolby with the Oscars, JAMstack_conf, Yelp Inc, Google & many others!